Home baked tortillas are less oily and less salty, making them a healthier, tastier choice. With these chips, it's all about the quality of the tortillas. Look for homemade, authentic tortillas. Costco sells some that are not cooked and are amazing. Break apart the packages and freeze in packages of 6 and thaw to use as needed. Trader Joe's also makes a "truly handmade" corn tortilla. 1. Preheat oven and oil trays: Preheat oven to 350°F. Pour a few tablespoons of oil into a bowl and brush a thin coating onto your baking trays. Set aside. 2. Oil and stack the tortillas: Place one tortilla on the cutting board and brush the top with a light layer of oil. You don't need a lot of oil, but do pay attention to the outer edges of the tortilla, an area that's easy to miss. Place another tortilla on top of the oiled one and brush the top with oil. Continue in this manner until all your tortillas are oiled and stacked in one pile. 3. Cut into wedges: Using a large, sharp knife, cut your tortilla stack in half using one firm chop, if possible. Cut one of the halves in half and cut each of those halves in half again, forming wedges. Repeat with other side. This will give you eight stacks of tortilla wedges. 4. Arrange on trays and salt: Arrange the tortilla wedges in a single layer on the oiled trays. Place the wedges with the un-oiled sides facing down so that they have contact with the oil on the tray. A little overlapping is fine, but don't overlap too much or they won't crisp. Sprinkle a pinch or two of flaked sea salt over the tops, being sure that all of the wedges get a touch of salt. 5. Bake for 8 to 12 minutes: Place trays in the oven and bake for 8 - 12 minutes. Check your chips at 8 minutes and rotate your pans. Be aware that very thin tortillas are vulnerable to your oven's hot spots and can start to char. The chips are done when the edges are crisp and dry and slightly lifted from the tray. They should be a few shades darker, though not completely browned. 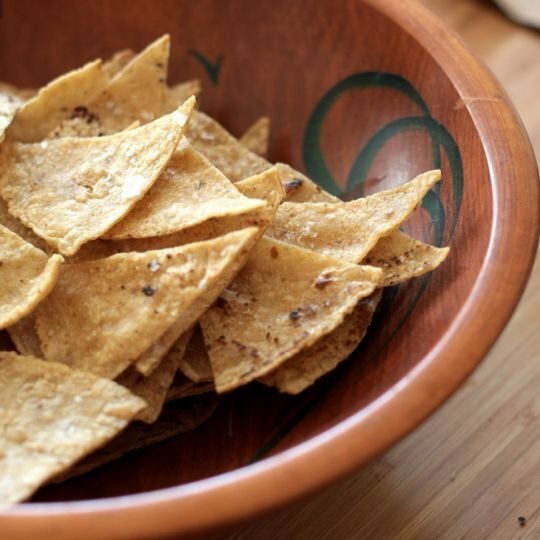 (Chips made from handmade tortillas will often have a few brown spots on them so don't worry if you see a few.) The chips will still be slightly flexible in the middle, but will crisp further as they cool. 6. Remove and cool: Remove trays from the oven and let cool slightly. As they cool, the chips will continue to crisp all the way through. Test one and if it isn't as crisp as you would like, return the trays to the oven for another 2 or 3 minutes. Once the chips are fairly cool, remove them from the tray and serve. If you're not eating them right away, store in an airtight plastic bag or container. Homemade chips are especially susceptible to getting stale, so be sure to bag them up as soon as possible.